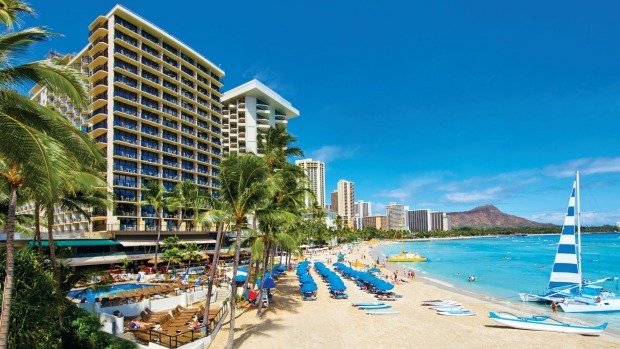 Get four nights for the price of three on a Leap Year holiday at the Waikiki Outrigger Resort. Outrigger Waikiki Beach Resort is offering a Leap Year Special. Get four nights for the price of three when staying through February 29, 2016. From $358 a night for sale till February 14, 2016, and stays February 26 to March 3, 2016. See outrigger.com. Stay seven nights and pay for only five at The Breezes Resort and Spa, Bali, with breakfast daily and airport transfers plus discounts on food and experiences. From $485 a person for travel until December 25, then January 6 to March 31, 2016. Valid for sale until March 31. Phone 1300 939 414 or see flightcentre.com.au. Save an early-bird 20 per cent plus receive a free cabin upgrade on some three, four and seven-night Captain Cook Fiji cruises, such as the three-night Southern Yasawa​ Cruise of the Mamanuca and Southern Yasawa​ Islands, with lots of inclusions. From $996 a person. Travel till March 31, 2017. On sale until November 30, 2015. See captaincookcruisesfiji.com. Save a big $2410 a person on Uniworld's 15-day Splendours of Italy. It includes a week on the River Countess exploring Venice, Padua, Bologna and Ferrara, two nights in Florence and three in Rome. From $6849 a person, twin share, for May 6 and 13, 2016, departures only. Book by November 15. Phone (02) 9028 5199. See Uniworld.com. Take 10 per cent off a 17-day South African tour that goes from Johannesburg to Cape Town, with meals, game viewing, national park fees and road transfers, three-star accommodation and excursions. The price is $3699 a person twin share if booked by November 12 for travel January 16 to the end of September, 2016. Phone: 1300 237 422 and quote "Essentially South Africa". See benchinternational.com.au. Early-bird book any Scenic India tour of 21 days or longer and fly free, including taxes; a saving of up to $2900 a couple. Or for tours of 13 to15 days, one person in a couple flies free, including taxes up to $855 – a saving of up to $1450 a twosome. The tours offer many inclusions. The flight deal is valid for sale till March 31. See scenic.com.au. This Luxury Escapes eight-night Vietnam holiday gives you six nights in a Deluxe Pool View Room at Vinpearl Da Nang Resort & Villas, including breakfast, lunch and dinner, two nights at the five-star Sofitel Saigon Plaza, and more. The price is $1399 a person (twin share) for value up to $6140. Valid for sale till November 7, with validity for travel until December 2016, with minimal blackout periods (travel is available during most of the summer holidays). Phone 1300 889 900. See LuxuryEscapes.com. Grand Solmar resorts is offering up to 60 per cent off stays at its three Los Cabos properties for Australians up till Christmas. For instance, stay at Grand Solmar Land´s End in an ocean-view Grand Studio. Normally $1676 a night, a seven-night stay is $5780. The deal is valid for Australian travellers only, and for stays up till December 23. See solmarpromotions.com/weloveaustralia/. Planning on taking the tribe on your own European grand tour in 2016? Receive up to 15 days free, petrol rebates and reduced rates when leasing new Citroens as part of globalCARS Early bird deals for 2016. The minimum lease period is 21 days and the free days are then added. From $31 a day. Phone 1300 789 992. See globalcars.com.au. Save 30 per cent on stays at award-winning Heron Island Resort during turtle-breeding season with TravelOnline. Get four nights for the price of three in a Turtle Room, breakfast, free daily snorkel hire for two adults, free accommodation for kids under 12 and half-price return coach and launch transfers from Gladstone. From $540 a person, twin share. Valid for sale until November 10 for select dates up to March 24, 2016. Phone 1300 883 887. See travelonline.com. Q: What are some great value cruise options for those seeking to go off the beaten track in 2016? A. I really like the options in the Baltic region. Cruise itineraries are pushing north and including Greenland and the Arctic Circle as well as offering wonderful views of the Northern Lights. Scandinavia is an expensive place to holiday and cruising allows you the all-inclusive value for money of your ship while you tour the area. But if you really want to find the road less travelled then you should look for repositioning cruises. This happens when cruise lines relocate their ships between regions and they provide unusual itineraries and great value for money. For example, Norwegian Cruise Lines is sending the Norwegian Star from Barcelona to Asia and then down to Australia in 2017. This itinerary offers a number of interesting sectors, such as Barcelona to Dubai and Dubai to Singapore. Or MSC is famous for their Grand Voyages from South America to the Mediterranean. You will also find great itineraries and prices when ships relocate from North America or Asia to Australasia.These options are not just for those with lots of time, often you can choose a sector of these itineraries that suit your availability. Many people would like to contribute in some way to the places they visit. But rolling up their sleeves and building schools and other voluntourism experiences may not be for them, for whatever reasons. So far, $500,000 of that has gone towards Sumatran orangutan conservation and the tours contributed more than $1 million into the local Sumatran community ecotourism programs. "It's a great revenue for local people, so that they don't rely on damaging their natural resources for money, but can help protect these resources," says McKelson. "I also have developed very close and key relations with our local guides. I've spent time training them how to speak English and more importantly worked with them so that they understand the broader issue of habitat protection and orangutans." She is quick to point out that as hard as she's working on that, for tour participants, "it is a holiday." And a special one, at that. "Clients feel they have been so moved by the experience – witnessing a wild orangutan, bathing an elephant, waking up to the sound of the rainforest, camping behind a nine-metre waterfall in a remote forest cave. The journey is healing and almost a natural therapy session for the week." McKelson says, at the beginning the customer base was mostly animal lovers, but not it's extended to family groups and organised groups, and the biggest growth area is in solo women travellers, aged 45 to 65. RAW is growing in other countries, such as Sri Lanka, Cambodia, Borneo (Malaysia) and on the African continent. In 2016, it expands into Mongolia. "In these other destinations, our aim is to support local community travel programs, which are not owned by RAW but are sold by RAW. We believe in grass-root community ecotourism and country-owned travel programs which promote sustainable travel within all destinations." Air travel to and from small regional airports that are served by just one or two airlines often means sky-high ticket prices. Look for land services that will get you there from the nearest hub city, where competition means fares are more in your favour.